Your Own Toll Free Number! Get your own Toll Free number now! Starting at just $2 per month. Send and receive texts on you Kall8 Numbers. Instantly connect with your customers. Transfer your toll free numbers! Transfer your numbers from your current provider. It's easy and starts at just $2 per month. Complete control at your fingertips with the click of a mouse! Kall8’s secure online management is included free with toll free service. 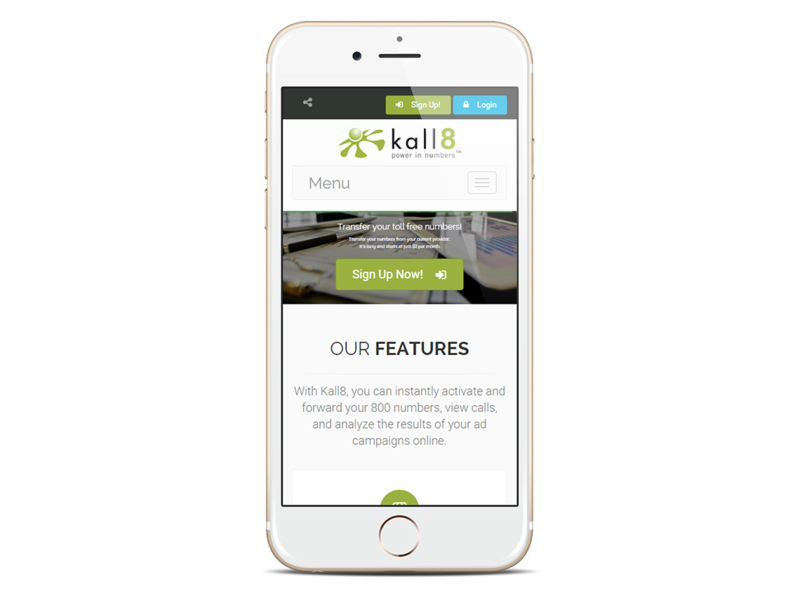 All Kall8 Numbers include our huge set of features at no additional charge. 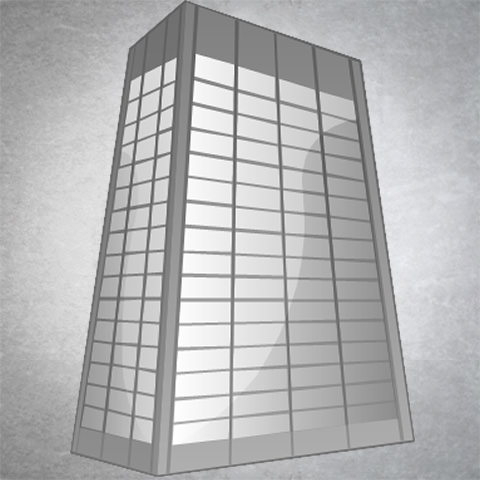 Features like Custom Call Forwarding and Conferencing. Kall8 provides enhanced services that are available for an additional charge. Features like Virtual PBX, Hunt Groups and more! Get Your Own Toll Free Number! It's easy to get your toll free numbers starting at only $2 per month. Simply select a number from our extensive list of toll free numbers. Kall8 is the only fully integrated toll free service that offers traditional 800 service with a complete set of online tools to manage and track your toll free numbers in real time. Our online tools put you in total control of your numbers. 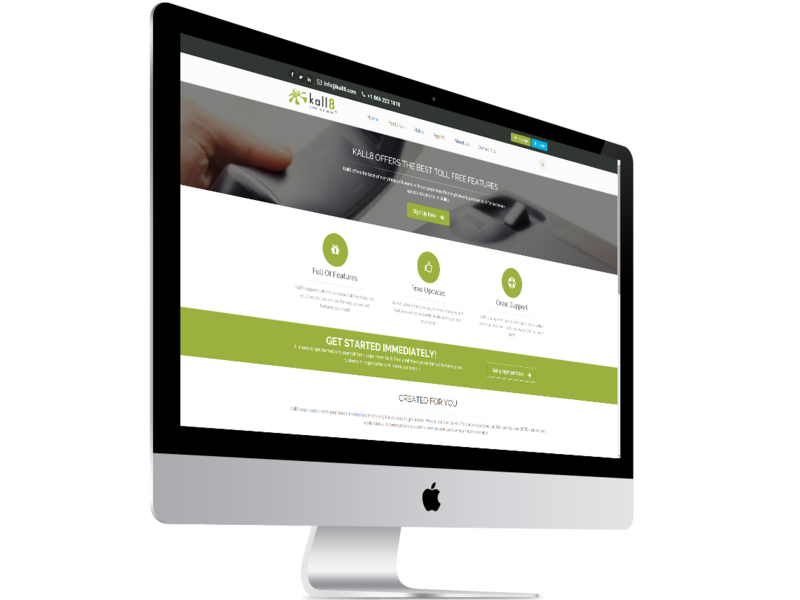 Every feature imaginable to support your toll free numbers. Our eager support staff is waiting to support your every need. We've built our Toll Free Kall8 product for our own use and because we use it in our own applications, you can be assured that it will meet or exceed all of your requirements. Complete account control at your fingertips! Several cutting-edge enhanced services are available. You can change number settings in real time. Change your ring-to number instantly using the Kall8 online web interface or have your ring-to number changed automatically depending on time of day. Generate reports dynamically by date, length of call, or calls to or from a specific number. Use Call History to build customer databases, monitor ad campaigns and more! Assign a different Campaign Name and 800 number to each of your ad campaigns and analyze the results. View total volume and percentage of calls for each campaign. Real Time Call information is stored for three days and provides the name and phone numbers of all callers, even if the line is busy, unanswered, or the call is blocked. Keep track of your Kall8 usage online. This is a great tool for budgeting purposes. View and update your payment method online. View your payment history and statements. Set up a Toll Free Number Login that will allow the user to have online access only to their specific toll free number. Especially useful for corporate accounts and resellers. Listen to your voice mail messages, your recorded calls, and view your faxes online. Search for recorded calls by date, recording length, or from/to a specific number. Kall8 is so Convenient for my Customers! I just wanted to let you know your service has worked out incredibly well for me. It has been so convenient for me to change the location phone number so easily. Pricing is very competitive, and the automatic billing to my card each month has gone off without a hitch. I Use Kall8 for All Our Lines! I have been with Kall8 since 2006. My LD carrier made me feel like it was an act of congress to get an 800 to change its ring destination. Now I use Kall8 for all of our lines with full control. I became aware just in time as our business was building. This toll free service is so cool, professional, and dirt cheap that Jen Thomas Corporation became an agent so that our clients can expand their business and organizations to reach the nation — toll free. Update your toll free location in real-time utilizing our on-line account management tool - any time, anywhere. All you need is a connection to the internet, and you instantly have access your account. View the history of all calls to your toll free number. All calls to your toll free number are date and time stamped for easy sorting and review. Export these records to generate leads or maintain a database of your customers. Get up to the minute information on who’s calling! Real Time Call information is stored for three days and provides the name and phone numbers of all callers, even if the line is busy, unanswered, or the call is blocked. Update your credit card online. View your payment history online. You can see all your invoice amounts and corresponding payments on the same page. View your statements online and more! Set up a Toll Free Number Login that will allow the user to have online access only to their specific toll free number. This type of login gives the user access to all aspects of that particular number except the ability to view any billing or account management information. This is especially useful for corporate accounts with multiple users or resellers who wish to give their customers access only to their specific information. Set up multiple users on a single toll free number using Custom Call Forwarding, then, using Ring-to Number Logins, give each user the ability to track their calls without being able to see the calls of the other users. Ring-to Number Logins are based on the ring-to number rather than on the Kall8 number itself. The users will be able to see the Call History and Call Analytics for calls that ring to their number only. Activate Voice Mail/Faxing and listen to your voice mail messages and view your faxes online. Activate Call Recording and listen to your recorded calls online. You can also search for a specific recorded call by date, recording length, or calls from/to a specific number.